To date, insulin therapy remains the cornerstone of diabetes management; but the art of injecting insulin is still poorly understood in many health facilities. To address this gap, the Forum for Injection Technique and Therapy Expert Recommendations (FITTER) published recommendations on injection technique after a workshop held in Rome, Italy in 2015. These recommendations are generally applicable to the majority of patients on insulin therapy, athough they do not explore alternative details that may be suitable for low- and middle-income countries. The East Africa Diabetes Study Group sought to address this gap, and furthermore to seek consensus on some of the contextual issues pertaining to insulin therapy within the East African region, specifically focusing on scarcity of resources and its adverse effect on the quality of care. A meeting of health care professionals, experts in diabetes management and patients using insulin, was convened in Kigali, Rwanda on 11 March 2018, and the following recommendations were made: (1) insulin should be transported safely, without undue shaking and exposure to high (> 32 °C) temperature environments. (2) Insulin should not be transported below 0 °C. (3) If insulin is to be stored at home for over 2 months, it should be stored at the recommended temperature of 2–8 °C. 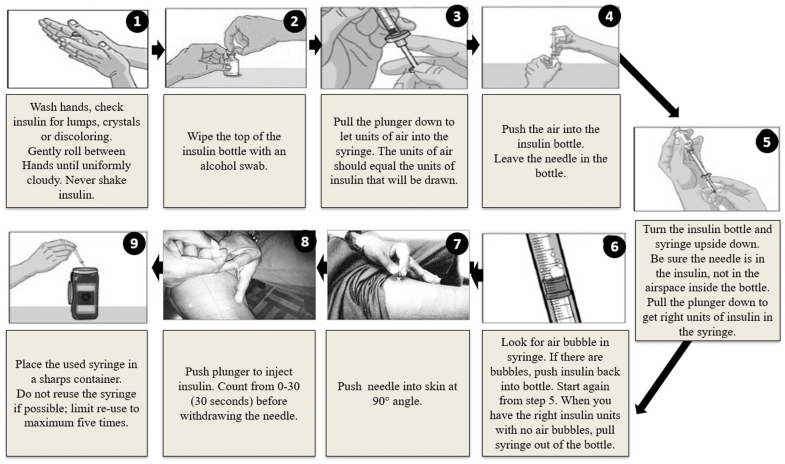 (4) Appropriate instructions should be given to patients while dispensing insulin. (5) Insulin in use should be kept at room temperature and should never be kept immersed under water. Immersing insulin under water after the vial has been pierced carries a high risk of contamination, leading to loss of potency and likelihood of causing injection abscesses. (6) The shortest available needles (4 mm for pen and 6 mm for insulin syringe) should be preferred for all patients. (7) In routine care, intramuscular injections should be avoided, especially with long-acting insulins, as it may result in severe hypoglycaemia. (8) The practice of slanting the needle excessively should be avoided as it results in sub-epidermal injection of insulin which leads to poor absorption and may cause “tattooing” of the skin and scarring. (9) In patients presenting in a wasted state, with “paper-like skin”, injections should, if possible, be initiated with pen injection devices, so as to utilise the 4-mm needle without lifting a skin fold (pinching the skin); otherwise lifting of a skin fold is required, if longer needles are utilised. (10) Reuse of needles and syringes is not recommended. However, as the reuse of syringes and needles is practiced for various reasons, and by many patients, individuals should not be given alarming messages; and usage should be limited to discarding when injections become more painful; but at any rate not to exceed reusing a needle more than 5 times. To view enhanced digital features for this article go to https://doi.org/10.6084/m9.figshare.7594157. The online version of this article ( https://doi.org/10.1007/s13300-019-0574-x) contains supplementary material, which is available to authorized users. Patients with type 1 diabetes (T1DM) require insulin therapy for their life time; and the majority of patients with type 2 diabetes (T2DM) will require insulin therapy over time, due to the progressive decline in β-cell function . The prevalence of known T1DM in East Africa is still low, but reported to be increasing; ranging between 4.8/100,000 and 16.4/100,000 in published studies . The prevalence of T2DM in recent population studies in East Africa, has ranged from 1.4% to 12.0%, with studies reporting over 50% previously undiagnosed cases of T2DM. Such patients are likely to present late with acute or long-term complications of T2DM and needing insulin therapy [3, 4, 5, 6, 7, 8, 9]. Therefore, within East Africa, there may be many patients requiring insulin therapy and assistance from health care providers in the management of the insulin therapy. In the absence of specific guidelines on insulin therapy for the region, the health care providers may not be in position to give detailed instructions to patients on proper injection techniques, and therefore there is an urgent need for guidelines on insulin storage and optimisation of injection technique in diabetes management, focusing on the East African region. Until recently, many of the recommendations on insulin administration, globally, had little or no scientific underpinning and were based as much on habit and tradition as on evidence . Moreover, the majority of patients with diabetes wish there were other ways of administering insulin, other than by injections, and are therefore not keen to learn about insulin therapy until insulin is prescribed. Therefore, improving patients’ perceptions and acceptance of insulin should be a primary goal of diabetes care . The importance of proper needle size, the correct injection process, complication avoidance and all aspects of injection technique from the first visit onwards should be addressed. There are currently three classes of injectable medications available for diabetes therapy: insulin, glucagon-like protein 1 (GLP-1) agents and amylin analogue [2, 3, 4]. These guidelines aim to complement previously published guidelines on insulin therapy  so as to optimise insulin therapy in diabetes management and will not discuss, in much detail, the administration of GLP-1 or amylin. These guidelines stress the need for correct technique in every insulin injection and show how critical this is for achieving optimal control of diabetes, noting that during the last few decades the recommended technique for insulin injection has changed . The introduction of shorter needles (4 mm for pen and 6 mm for insulin syringe) has led to the recommendation that the needle for administration of insulin should be inserted perpendicularly, without grasping a skin fold (pinching) . Therefore, appropriate training of health care professionals is important so that instructions to the patients are adequately provided . Table 1 summarises the recommended topics for diabetes educators regarding insulin injections. A list of recommended topics for diabetes educators with regards to insulin injections. Appropriate storage of insulin is necessary for preservation of insulin efficacy . In all of Eastern Africa except the southern highlands of Tanzania and the northern part of the region (Sudan, Red Sea, Afar depression, northern Somalia), temperatures vary no more than 5 °C; giving average room temperatures between 20–30 °C in most parts of the region . Therefore, in the absence of reliable refrigeration in patients’ homes in the majority of East Africa, it is prudent to recommend that within East Africa, insulin in use does not require refrigeration and should be kept at room temperature for a maximum of 6 weeks [16, 17, 18]. A literature search on injection technique and preservation of insulin was done using Medline, PubMed and the Index African Health Journals Database by one of us (SB). The search was focused on the period between 2010 and 2018, and was restricted to full articles and the English language. MeSH terms injection, insulin, “insulin therapy”, “subcutaneous injections”, “injection technique”, “insulin infusion”, “insulin storage”, “insulin transportation”, “cold chain” and Africa were used. One of us (SB) summarised the literature review and drafted the initial version of the recommendations to guide the workshop on insulin therapy in Kigali, 11 March 2018. This workshop comprised of health care professionals (HCP), experts in diabetes care and patients on insulin therapy. The proceedings of this workshop informed the final recommendations and consensus guidelines presented in this paper. The full list of attendees of this workshop is provided at the end of these guidelines. In drawing up the East Africa Diabetes Study Group (EADSG) guidelines: insulin storage and optimisation of injection technique in diabetes management, the authors adhered to the international and ethical standards in compliance with the Uganda National Council of Science and Technology (UNCST) for developing clinical practice guidelines (CPG) [20, 21, 22]. The hierarchical system of classifying the evidence is used in these guidelines and has been previously published . The system classifies quality of evidence (as reflected in confidence in estimates of effects) as high (Grade A) and therefore highly recommended for adoption, moderate (Grade B), or low (Grade C) according to factors that include the risk of bias, precision of estimates, the consistency of the results, and directness of the evidence; and consensus of expert opinion (Grade D) where there is hardly any published literature but consensus of expert opinion, to guide best treatement options in clinical practice. These guidelines are based on previously conducted studies and do not contain any studies with human participants or animals performed by any of the authors. Where photographs have been taken and used for demonstration, written consent was obtained and the photograph anonymised. The authors adhered to the international and ethical standards in compliance with the Uganda National Council of Science and Technology (UNCST) for developing clinical practice guidelines (CPG). 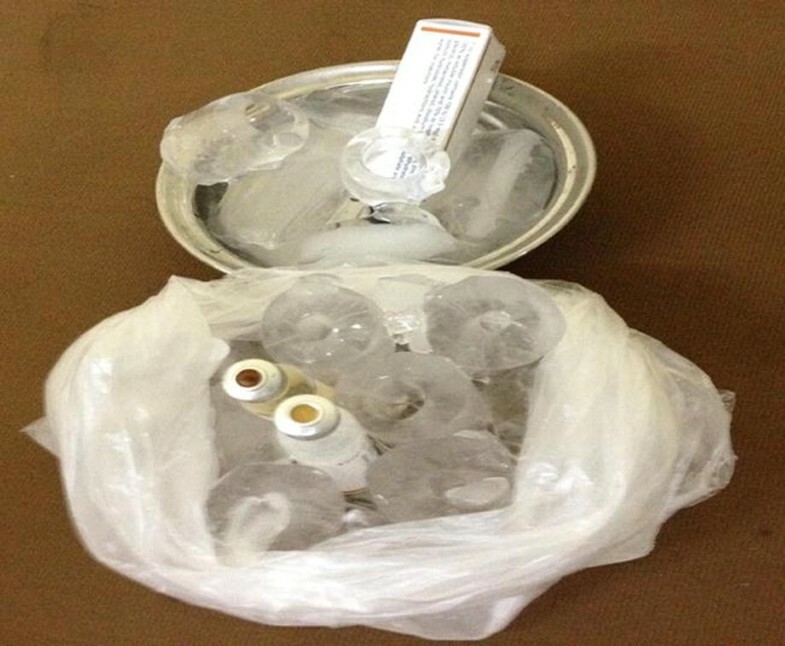 The cold chain process is used for maintaining medication such as insulin, vaccines, and biologicals within a recommended temperature range, mostly between 2 and 8 °C throughout the supply chain. Most insulin storage data comes from the manufacturers, with few independent studies. Temperatures outside the recommended range reduce the potency of biologicals, leading to lack of desired response. Therefore, a cold chain must be used while transporting insulin from the production facility to the distributor’s storage facility. A temperature log should be used for the whole transport. At the receiving end, the temperature log should be inspected by the recipient of the insulin and confirm the insulin was received in “good cold” chain. The practice includes sending the temperature log back to the manafacturer to confirm receipt of the insulin that mantained the recommended cold chain . In the event of a cold chain breach, medications must be discarded. This practice should be observed in all cases. 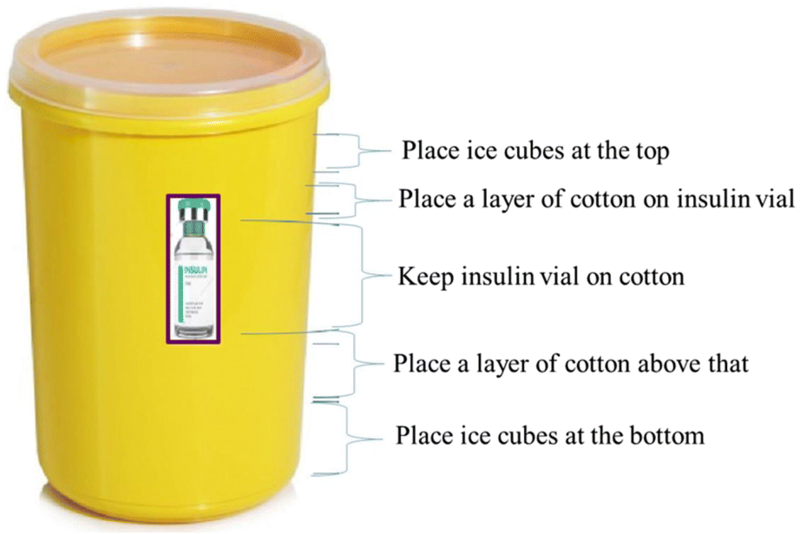 In the transportation of insulin from distributor to health care facility, suitable rigid containers should be used to maintain the temperature between 2 and 8 °C. Suitable cool boxes and gel packs should be used to maintain the recommended cold chain temperature. Insulin should not be transported in containers having temperatures below 2 °C, or be exposed to temperatures above 32 °C. Nowadays, boxes with sensors and a temperature logger are available that can accurately record the temperature within the box, and this option should be considered whenever feasible . The community health care facility should have a refrigerator to store insulin. Refrigerators should be placed at least at an arm’s length away from the wall, and also with sufficient space in between them, in the case of multiple refrigerators and/or freezers, so as to increase the air circulation. These refrigerators must not be used to store food, blood, or milk. The refrigerator for insulin should be defrosted every 6–8 weeks if it is not self-defrosting. The refrigerator for insulin should also have an integral thermometer which should be calibrated at least annually to ensure the readings are accurate. Upon arrival from the distributor, insulin should be transferred to the refrigerator immediately. The pharmacist/health care worker should know the recommended safe storage temperature for every medication dispensed. Insulin should be stored in a refrigerator between 2 and 8 °C and should never be kept in the freezer or placed directly on ice . Figure 1 shows a common mistake of putting insulin directly on ice, usually during transportation. This should be avoided. Insulin needs to be dispensed with very clear instructions to the patient on how it should be transported home and subsequently used. Insulin should be transported from the health care facility to home in a plastic container. Insulin should remain in its initial packaging to protect it from sunlight. Insulin should not be exposed to temperatures above 32 °C because higher temperatures will reduce its potency [16, 17, 18]. Common examples of high temperatures in day-to-day life in East Africa, where temperatures may exceed 32 °C, include car glove boxes and the top of the engine next to the passenger seat in a minibus. An insulated bag or a cooling pouch is ideal for transportation of insulin to avoid sudden temperature variations . A transport box can be improvised by using a plastic box as shown in Fig. 2. The common practice of placing insulin among ice cubes (as shown in Fig. 1); or strapping insulin directly on an ice pack is strongly discouraged as it may result in temperatures lower than the recommended 2 °C. Transporting insulin immersed in water is equally discouraged, as it destroys the labels on the insulin vials. Ideally, insulin should be stored in a refrigerator between 2 and 8 °C and also should be protected from light when vials or pens are unopened. The majority of families in East Africa do not have refrigeration facilities in their homes, and therefore other methods of safely storing insulin should be devised. Vials in use may be kept at room temperature (20–25 °C), protected from sunlight, for 6 weeks, and 4 weeks if the temperature goes up to 30 °C, in a clean plastic box (Fig. 3). Storage at a higher temperature during use may degrade the insulin or convert it to higher molecular weight components . Patients with diabetes need to be educated about temperature variations and duration of storage of insulin vials for maintaining the efficacy of insulin . Keeping insulin in clay pots is likely to cause contamination as it is difficult to keep it clean: this should be avoided. Clay pots have been previously recommended . Insulin is started after all other therapies fail. Once on insulin treatment, it is always insulin treatment. Patients on insulin must eat before the insulin is injected, or else they pass out. Patients must always have a refrigerator at home to keep the insulin in. Insulin injections are always very painful. Injections are a social stigma. Starting insulin therapy means that the diabetes is severe and the patient has reached the end-stage (death is near). Injection sites will soon become raw and exhausted. Insulin induces hypoglycaemia, a condition synonymous with death; and that this is almost always occurs in patients on insulin therapy. Patients should be reassured and counselled about the safety of insulin therapy. They should be informed that initiating insulin therapy does not necessarily imply that the diabetes is in the last stage, and that well managed insulin therapy poses minimal complications. Patients with T2DM should be informed that insulin may be started right at the time of diagnosis, especially when metabolic control is poor and the blood glucose level is very high. They should also be told that, depending on the metabolic response, some patients may be shifted to oral hypoglycaemic agents after stabilisation of the metabolic state. Patients requiring long-term therapy with insulin should be informed accordingly and given the reasons why alternative medications are not applicable. Psychological insulin resistance is a term that physicians use to describe the psychological barriers against initiation and persistence with insulin therapy among patients. These barriers include cognitive, emotional, rational and cultural obstacles, but not psychological disorders. By preventing patients from starting and continuing to take the required insulin, psychological insulin resistance can lead to persistent hyperglycaemia and increased risks of developing complications. These barriers need to be identified and addressed . Referring patients for diabetes self-management education and medical nutrition therapy. The demonstration site should be similar to the sites of injection the patient is advised to use. Do not demonstrate on the leg, when the injection should be given on the thigh [19, 25, 26, 27]. Therapeutic education is a process where the competencies (knowledge, skills and attitudes) and the necessary support for self-control of a disease are provided to the patient and his/her family and the competencies integrated into the treatment . Traditionally, diabetes educators “instruct” patients and their relatives to follow the prescribed treatment. Such information is not sufficient to change their health behaviour. A patient’s adherence depends on the learning strategies being used. In therapeutic education, patients acquire knowledge about their disease and the basis for treatment, so that they integrate knowledge and skills acquired into their daily lives to improve care and prevent acute and chronic complications. 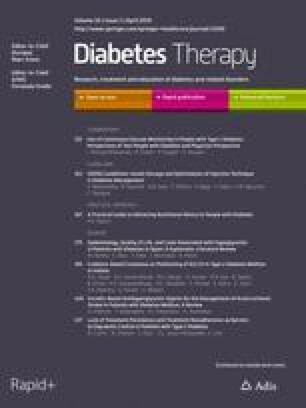 Therapeutic education for diabetes should accompany dispensing of insulin [28, 29, 30]. The patient should be counselled and be informed that most people are afraid of the needle prick, until they do it and see how relatively pain-free it actually is. The sizes of the needles available should be demonstrated to reassure the patient that the needles are thin and short. Insulin is effective only if administered appropriately. Patient surveys demonstrate that patients continue to have many issues with insulin injection technique, highlighting the need for effective patient education . The four safe areas for insulin injections are the sides of the thighs, the backs of the upper arms, the abdomen and the upper outer buttocks. To avoid bumps and scar tissue on the skin, rotation of insulin injection sites should be done and a systematic approach to injection site rotation adopted. Thus, injections may be given in the abdomen, outer thigh, back of the arm, and flank/buttocks regions. The sites for rotation are shown pictorially in Fig. 4a, b. Insulin injected on the abdomen acts faster than insulin injected on the thigh. The rate of absorption of insulin injected on the arm is between that of insulin injected on the abdomen and that injected on the thigh . To always visually inspect the injection sites before injecting insulin. To palpate the injection sites before injecting insulin. Patients should be instructed on how this is done. To avoid injecting into sites with lipohypertrophy, oedema, inflammation or signs of infection. To bathe with soap and water daily. To rotate sites of injection every day. Not to reuse the needle if possible; otherwise limit the reuse when injections become more painful; but should not reuse needles more than 5 times. There is no need to swab the area, if clean. If the injection site is not clean, clean with plain water. Swabbing with spirit-swabs is not recommended as it leaves the skin dry. Although insulin injections usually cause no significant pain, injecting at the same spot repeatedly can cause inflammation or fat tissue increase (lipohypertrophy), or scarring. Lipohypertrophy or scarring leads to poor insulin absorption and depot formation, which may affect insulin release, causing early postprandial hyperglycaemia and/or delayed hypoglycaemia. Therefore, rotation of injection sites is important to prevent lipohypertrophy and scarring, and thus improve the predictability of insulin absorption and action. Recommended ways of rotating injection sites are shown in Fig. 5. The same site should be used for at least 1 month and rotation should be done within the same site, rather than rotating to different sites with each injection. Each injection should be away from the previous one by a fingerbreadth (2.5 cm). Use of same site decreases variability in day-to-day absorption of insulin. A site with open wounds or blisters should be avoided. Blood glucose monitoring should be done on change of site. Change of site of injection is frequently associated with hypoglycaemia . For small children, it is good to use all the areas — arms, legs, abdomen and backside. Bigger children and teens should use the abdominal area most often. Carrying insulin while travelling in hot climates can be a challenge. Insulin may be packed in a tight polythene bag and kept inside a small thermos flask . Do not keep insulin in a locked car or in the glove compartment. Temperature in closed vehicles may reach very high levels (above 32 °C), with loss of potency of insulin . When travelling by air, carry insulin supplies, along with a prescription, in cabin baggage or handbag. Luggage which is checked-in is stored in the aircraft’s hold and may freeze: any insulin in this luggage may lose its potency . Do not store insulin near extreme heat (above 32 °C) or extreme cold sources (below 2 °C) . Identify an appropriate location for insulin storage and follow the guidelines for insulin storage. Train one person from the school about insulin administration, doses/injection times prescribed for specific blood glucose values and for carbohydrate intake. The person should liaise with parent/guardian on insulin supplies and other essentials for diabetes care. Identify a location in the school to provide privacy during insulin administration, if desired by the student and family. The school authority should permit the student to check his or her blood glucose level and take appropriate action to treat hypoglycaemia or hyperglycaemia, when need arises. A school authority and preferably peers of the student to recognise symptoms of hypoglycaemia and hyperglycaemia and their immediate management. A school authority and preferably peers of the student to understand how participation in physical activity can be safely done. A school authority to receive instructions for handling diabetes emergencies. A school authority to have a plan for the disposal of sharps and other health waste. Insulin should be carried in a container to prevent exposure to extreme temperature and sunlight. If the work is in the field, the insulin should be placed in the shade where the temperatures are not high. The employer should provide a convenient place to store insulin and other supplies, if work conditions are not suitable for the temporary storage of insulin while at work, especially if the work place is not private enough to administer insulin. The employer should give permission to the employee to take short breaks to administer insulin as required. The employee should be permitted to consume food or beverages as needed at their desk or workstation, but this should conform to the social and cultural norms of the society, otherwise a convenient place should be identified for the patient to use [28, 35]. Multiple and varied factors affect insulin absorption. These are listed in Table 2. Patients should be told about these factors and be allowed to discuss factors that do affect the absorption of insulin. The abdominal site is the least susceptible to factors affecting insulin absorption. To minimise the variability of insulin absorption, patients should use one site of injection for a particular time consistently . Washing of hands with soap and water or with an antiseptic is required as a hygiene process. Hands should be dried before starting the process of injecting insulin [36, 37]. Swabbing of the skin with antiseptic is not necessary. Patients should keep clean all the time, and it is advised that they bathe daily. If the injection site seems dirty, cleaning of the skin with water should be done and thereafter dried with a clean towel. If an antiseptic cleansing agent is used, then the skin should be allowed to dry before injecting insulin . Disposable plastic insulin syringes are the most widely used devices for insulin injection. Insulin syringes are available with 0.3-, 0.5-, 1-, and 2-ml capacities. 0.3-ml insulin syringes are graduated in 1-unit intervals and are ideal for doses under 30 units because of their discrete size and easy 1-unit adjustment. 0.5-ml insulin syringes are graduated in 1-unit intervals and are ideal for doses between 30 units and 50 units. 1-ml insulin syringes are graduated in 2-unit intervals and are ideal for doses over 50 units. Length and thickness of needles have been reduced to minimise the pain during the injection, and to prevent inadvertent intramuscular administration of insulin. In the past few years, insulin needles were quite long (12.7 mm); these are no longer recommended. Shorter needles of 8-mm and 6-mm length were developed to reduce the pain, and avoid inadvertent intramuscular injection of insulin. Currently a 4-mm needle is available for pens and a 6-mm needle is available for syringes: these are suitable for all people with no pinching. Pinching may be necessary for some individuals with thin skin when using the 6-mm or larger needles. In East Africa, the conventional insulin and syringe are the most commonly used, while a few patients use pen devices. The cost of pen injection devices is a barrier to their use in East Africa. Inconvenience of carrying several materials. Adverse psychological and social impact of using a syringe (syringes are associated with sickness and drug abuse). Use of an incorrect insulin product. Failure to administer accurate doses. The first insulin pens were introduced in 1985, but they required loading. Loading was eliminated in 1989 with the development of the first fully disposable prefilled insulin pen. It was developed to improve treatment compliance. Pens are simple to use; and patient preference and satisfaction with insulin pens may lead to better adherence and thus better glycaemic control, which leads to reduced health costs. Insulin pens are significantly less painful and the scale is easier to read compared to the conventional vial/syringe. Disposable or prefilled insulin pens: these devices come with insulin. Insulin pens may be beneficial in difficult-to-treat patient populations such as elderly individuals, patients with visual or dexterity impairments, children, and insulin-naive patients. The benefits of prefilled disposable pens have been established in a number of studies . Limitations of insulin pens include higher prescription cost and inability for patients to mix their own insulin formulations . Pen needles are available in different lengths: 4, 5, 6, 8, and 12.7 mm. Shorter and thinner needles cause less pain; thinner needles cause less penetration force; while the five-grind needle tip needles cause less penetration force [38, 39, 40, 41, 42, 43]. Pen needles with additional features to prevent injuries have been developed . Ideally, disposable syringes and pen needles should be used only once. Reuse of syringes and needles may not guarantee sterility. Patients with poor personal hygiene, acute concurrent infections, open wounds on the hands, or decreased resistance to infection for any reason should not reuse a syringe or pen needle. The newer, smaller (30- and 31-gauge) needles have a thin tip. The needle tip can become bent to form a hook with single-use, which can lacerate tissue or break off to leave needle fragments within the skin. This may increase lipodystrophy or have other adverse effects . Some patients reuse the needles for various reasons. Many patients find it burdensome to carry extra needles when away from home. They are also reluctant to carry containers to dispose of used needles. Others find that the injections from reused needles are not noticeably more painful. For reuse of a needle, it must be recapped after each use, and an inspection of the injection sites for redness or swelling must be done. A needle should be discarded if it is noticeably dull or deformed or if it has come into contact with any surface other than skin [29, 41, 44]. Diabetes patients use various insulin pens, needles, syringes and lancets at home as a part of their self-care. Sharps, e.g. hypodermic, intravenous or other needles; auto-disable syringes; syringes with attached needles; infusion sets; scalpels; pipettes; knives and broken glass all contribute to the general sharps waste in the home, and should be disposed of safely. Lack of information about how and where to dispose. Lack of proper advice by doctors and nurses. Some patients feel that using community sharps disposal services may result in revelation of their diabetes status, which may have been kept confidential. The perception that disposal of sharps into pit latrines or burning them in cooking fire stoves is a correct way of disposing of sharp hazardous waste, and cheaper. It should be stressed to patients, their care givers and their families that home-generated hazardous waste resulting from syringes, insulin pens, gloves, blood glucose test strips and catheters used in day-to-day care needs to be disposed of safely. Sharps and, more specifically, needles, are considered to be the most hazardous category of healthcare waste for health care workers and the community at large, because of the risk of needle-stick injuries which carry a high potential for infection . Waste should be segregated and disposed of safely. The correct segregation of health care waste is the responsibility of the health care provider and/or patient and care giver who produces each waste item. The simplest and safest waste segregation system is to separate all hazardous waste from non-hazardous general waste (which is generally of larger quantity) at the point of generation. The hazardous waste portion is very commonly separated into two parts: used sharps and potentially infectious items. Consequently, the segregation into separate containers of general non-hazardous waste, potentially infectious waste and used sharps is often referred to as the “three-bin system” . Table 3 summarises the options for safe disposal of health care waste that may adopted by patients and their care givers. Safe disposal of sharps used by patients with diabetes in different countries , showed that most of them followed either drop boxes, puncture-proof containers disposed of in the trash, and sharps container disposal at designated sites (Table 3). Studies on waste disposal in East African countries have highlighted challenges that range from lack of knowledge to lack of resources to implement good practices. There is therefore a need to identify cost-effective need-based solutions which are easily implementable as well as sustainable in East African countries . When the local site for the injection is deemed clean, there is no need to prepare skin with alcohol or other antiseptic prior to lifting the skin fold and injecting the insulin . Insulin should be injected and deposited into the subcutaneous space when prescribed as subcutaneous injection. Therefore, an appropriate needle size and length should be used. A 4-mm needle (pen device) or 6-mm needle and syringe is recommended. Lifting a skin fold (pinching) is done to avoid inadvertent intramuscular injection, and this should be done with 6-mm or longer needles, especially in children and other patients with thin skin. The correct technique for lifting a skin fold (pinching) for injection should be taught to all patients. The lifted skin fold should be lifted up gently and not squeezed tightly to causes skin blanching or pain. Figure 6 shows a correctly lifted up (pinched) skin fold. In East Africa, patients use syringes as their primary injecting device. It is recommended to use U-100 — 1.0-ml or 0.5-ml syringes. Careful attention should be paid to labels on the syringes when purchasing syringes, to ensure that correct syringes are purchased, especially if purchased from outside East Africa. There is no medical rationale for using syringes with detachable needles for insulin injection. Permanently attached needle syringes offer better dose accuracy and reduced dead space, allowing the patient to mix insulins if needed. There are currently no syringes with a needle less than 6 mm in length, due to compatibility issues with insulin vial stoppers . Insulin injection involves 2 steps: filling the syringe and injecting. The steps for injecting insulin are given pictorially in Fig. 7 . Choose where to give the injection. It may help to keep a chart of places used, so that insulin is not injected in the same place more than once in a day. Keep the injection 2.5 cm (one finger breadth) away from scars and 5 cm (two finger breadths) away from the umbilicus. Insulin should not be injected into skin that is bruised, swollen, or tender. The site chosen for the injection should be clean and dry. If the skin is visibly dirty, the area should be cleaned with plain water. Swabs containing spirit should not be used on injection sites; if used, the area should be left to dry prior to giving an injection of insulin. Patients are encouraged to bathe after work, and daily with soap and water to maintain good hygiene. If required lift (pinch) a skin fold and aim the needle perpendicularly at an angle of 90°. The procedure is the same whether a pen device or syringe is used to administer the insulin. Push the needle into the skin. Let go of the pinched skin. Inject the insulin slowly and steadily until it is all in. Leave the syringe in place for 5–30 s after injecting; ensured by counting from 0 to 5 or up to 30. In East Africa we prefer to tell patients to count from zero to thirty as this is easily remembered. Pull the needle out at the same angle it went in. Put the syringe down. If insulin tends to leak from the injection site, put some pressure on the injection site with a piece of cotton swab for a few seconds: DO NOT RUB. If bleeding occurs, apply a cotton swab with some little pressure for 30 s. This is usually sufficient. DO NOT RUB. Place the needle and syringe in a safe hard container. Close the container, and keep it safely away from children. This is the sharps waste container and the needles will be disposed of later appropriately. If the syringe and needle are to be reused, the needle should be carefully recapped, stored away in a clean container and reused later, but not more than 5 times. If more than 50 units of insulin is to be injected, it is advisable to split the doses and administer the divided doses either at different times or using different sites for the same injection. The health worker should be the one to determine the splitting of the doses. Large volumes of insulin are associated with more insulin absorption variability, which should be avoided. For lean patients, it is recommended to use a 4-mm needle with a pen injection device, otherwise employ the combined use of a raised skin fold and angled insertion of the needle, if using needles longer than 4 mm [49, 50]. Needle length should not be a concern in patients who are obese or overweight. In obese patients it still recommended to use 4- to 6-mm needles. Lifting a skin fold is not necessary in obese patients . Lipohypertrophy is enlargement of adipocytes that manifests as swelling or induration of fat tissue, caused by insulin injection. Lipohypertrophy is seen in up to 50% of patients taking insulin . Examine the sites for lipohypertrophy at least every 3 months, or more frequently. Injection sites should be gently palpated in order to feel the lipohypertrophy. Patients should be instructed on how to palpate the injection sites routinely; and on how to inspect their own sites. Patients should be given training in site rotation and proper injection technique. The size of the lipohypertrophy should be estimated by feeling its extreme edge and measuring its longitudinal and transverse diameters using a point 5-cm (two finger breadth) away from the extreme edge of the lipohypertrophy. The site and the size of the lipohypertrophy should be documented in the patient's notes and referred to in future assessment of the lipohypertrophy. Patients should be requested to avoid injecting into areas of lipohypertrophy until the next examination. Recommend use of larger injection zones, correct injection site rotation, and non-reuse of needles. A reduced dose of insulin may be required after switching injections away from the lipohypertrophy, to avoid hypoglycaemia, as absorption of insulin will be better. Measure the blood glucose and adjust insulin dose. Inject insulin that has a temperature of the surrounding room (20–30 °C). Avoid the use topical alcohol for swabbing. Relax the muscles at the site during the process of injection. Do not change direction of the needle during insertion or withdrawal. Do not reuse needles, if possible. Do not use an injection device that puts pressure on the skin around the injection site. Apply a little pressure for 5 to 8 s after the injection, without rubbing: this is advised if an injection seems especially painful. Diagnosis of diabetes in childhood causes stress and anxiety which hinders a parent’s ability to administer insulin or encourage children to self-administer insulin. Health care professionals should give appropriate education and demonstration of injection technique on themselves (“walking in the patient’s shoes”): it helps parents, care givers, and children to overcome anxiety and other issues. Play therapy is a useful method of explaining injection technique. Injecting toys, dummies and “oranges” is strongly discouraged as it creates more fear and anxiety. All those present (physician, nurse, parents and relatives) should give the injection “without insulin” and appreciate “there is no pain” [51, 52, 53]. The thickness of skin and subcutaneous tissue varies from 4.9 mm in the arms of 2–6 year olds to 8 mm in 14–17 year olds. The skin surface to muscle distance is < 4 mm in nearly 10% of children, especially in the 2- to 6-year age group. In this age group, the risk of intramuscular injections using the 4-mm pen needle, even when lifting a skin fold (pinching) is not done, is low (20.2%). The 4-mm pen needle should therefore be the recommended needle for all children. However, because the 4-mm needle is only available with pen devices, in East Africa it is recommended that a 6-mm needle and syringe be used along with appropriate lifting of a skin fold, to reduce the risk of intramuscular injection in children . For small children, it is good to use all areas — arms, legs, abdomen and the backside. In bigger children and adolescents, the abdomen may be used more often. Choose the thighs or the buttocks for the evening NPH. This helps lower the chance of hypoglycaemia during the night. Choose the abdominal area if exercise that will involve using the arms and legs is planned. Exercise can changes the dynamics of insulin action and should always be considered when insulin is being administered. There is no right age for the child to start injecting on his or her own. Some children may want to get used to having injections given to them by an adult, before learning to inject themselves. Studies have shown that children above 11 years can independently inject insulin. Children should not be excessively pressurised to administer their own injections. When they’re ready, encourage them to self-inject. They should always be supervised . The fear of needles or needle phobia is common among children and adolescents. Consider intervention strategies for the parents to address needle anxiety and pain. Parents themselves have to be calm and composed before any injection. This is comforting for the child. Identify the past experiences with injections. Select appropriate syringes with needles attached or pens and 4-mm needles. Compare the needles used for other injections and insulin. Discuss how needles have been designed to improve patient comfort. Discuss alternative regimens to maintain adherence and reduce pain [54, 55]. Insulin under- and overdosing is an important area in patient care, but cannot be discussed in detail in these guidelines. Suffice to mention that when it is suspected, it requires specialised attention and care . An optimal injecting technique during pregnancy has not established. However, the following recommendations are considered reasonable. The abdomen is generally a safe site for insulin administration during pregnancy. However, as thinning of abdominal fat from uterine expansion is common, pregnant women with diabetes (of any type) should use a 4-mm pen needle when injecting on the abdomen. Other areas follow similar recommendations as in non-pregnant state. First trimester: hypoglycaemic events are most common during the 1st trimester. Close monitoring and dose adjustments are important. No change in insulin site or technique is needed. Second trimester: insulin can be injected over the entire abdomen as long as properly raised skin folds are used. Lateral aspects of the abdomen can be used to inject insulin when no skin fold is raised. Third trimester: injections can be given into the lateral abdomen with properly raised skin folds. Apprehensive patients may use the thigh, upper arm, or buttock instead of the abdomen. Areas around the umbilicus should be avoided during the last trimester . Geriatric patients often have limited dexterity, visual impairment, and hearing impairment. Counsel elderly diabetes patients about the course of diabetes and proper injection technique. The elderly should be assisted by a care giver. Prevention and treatment of hypoglycaemia should be emphasised. Insulin pens are beneficial in the elderly due to their discreetness, simplicity, convenience of use and dosage accuracy. For visually impaired patients, the use of acoustic devices for glucose measurement is recommended. In patients with both visual and dexterity impairment, pre-filled syringes may be helpful. For patients with impaired hearing and those who use hearing aids, conduct education in a noise-free environment. In critically ill patients with hyperglycaemia, protocol-driven intravenous infusion is recommended. For achieving and maintaining glucose control in non-critically ill patients with diabetes or stress hyperglycaemia, scheduled subcutaneous insulin is recommended . The use of insulin pens instead of vial and syringes can provide several advantages for hospitalised patients, including greater satisfaction among them and health care providers, improved safety and reduced costs. Nurses need to follow the same principles of injection. 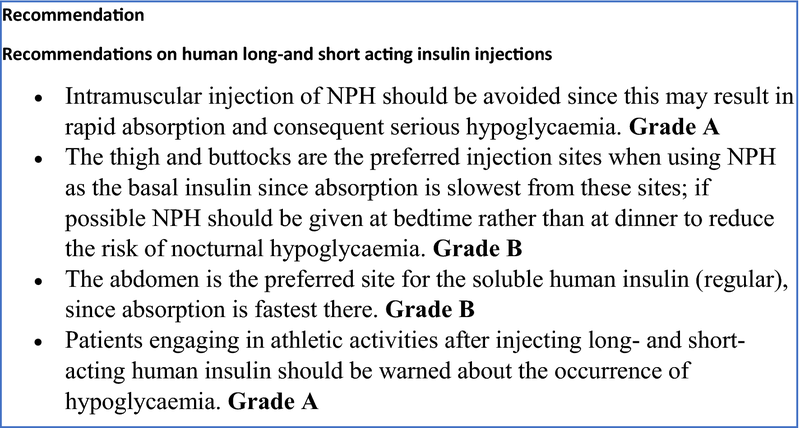 Note that when insulin has to be injected intramuscularly, a needle for intramuscular injection fitted to a syringe that can adequately measure insulin dosage should be used. The usual 6-mm needles or syringes will not deliver insulin intramuscularly . Community nurses may have to give insulin injections to patients, if self-injection is not possible by the patient, or cannot be administered by a care giver. The community nurse should therefore be trained in insulin therapy, especially if involved in diabetes care . A community nurse needs to learn how to administer insulin using both an insulin syringe and a pen device. Supplies of insulin syringes should always be available to community nurse teams. Review patients requiring insulin administration more than once a day to change to a once-daily regime wherever possible to reduce demand on the community team whilst maintaining appropriate glucose control and quality of life. It is recommended that a standard in-house protocol for community nursing teams to administer insulin be developed. It is recommended that such protocols should include the full name of the insulin, the dose to be given (with no abbreviation for the word ‘units’) and be signed and dated by the prescriber. These are the first injection technique recommendations for East Africa, and they focus on needle length selection, the injection process and the choice of body sites. The recommendations also cover how insulin should be transported from the health facility to the patient’s home and later how it should be stored at home. Additional recommendations have been provided on disposal of non-hazardous and hazardous (sharps) health waste; and the need to have national policies to cover these areas. Further recommendations have been provided on topics which, though addressed earlier, still lacked detail and specificity: lipohypertrophy, choice of needles in paediatric age groups, reuse of needles and patient education. These recommendations reflect our current synthesis of the available evidence, as well as expert consensus; we expect further changes following new research publications in this area, especially from the East African region. Regardless of the patient group, the present recommendations guide the health worker and the patient towards using shorter (4 mm with pens and 6 mm with syringe) needles. This appears to be the most efficient means of protecting against intramuscular injections in children and in those adults with “paper-thin-skin” who are not able to appropriately lift skin folds (pinch). There is no medical rationale for the use of needles greater than 6 mm in children and adolescents, nor adults. The move to shorter needles is appropriate given the improved understanding of the anatomy of the skin and subcutaneous adipose tissue at the common injection sites, without an associated increase in cost of the syringes and needles. This change needs to be appreciated by government agencies, who procure the insulin syringes. Decisions imposed on people suddenly, with no time to get used to the idea or prepare for the consequences, are generally resisted. This natural resistance to change may be the first barrier to the implementation of these guidelines; for example, health workers and policy makers may request more time to transition from longer needles to shorter ones. Health facilities in East Africa do care for patients with diabetes, both type 1 and type 2. However, only a few follow any specific guidelines, or have in-house protocols for managing diabetes [59, 60, 61]. Resources will therefore be required to mobilise the health care providers and educate them on the optimisation of insulin therapy and insulin injection technique. Patients with diabetes will also require a more detailed education on injection technique. While the cost of smaller-sized needles is not different from that of longer ones which may be in current use in most health facilities , the change to smaller-sized needles implies a policy change that is a process. Keeping insulin and vaccines in the same refrigerator at the community health care facility may meet some resistance as it also requires a policy change. Consensus statements were produced because of lack of randomised controlled studies and other hard scientific data. These may meet challenges. Health service delivery in East Africa still has unmet needs for the management of diabetes. This impacts adversely on the choices of medical therapy and consequently on the quality of care. For example, the quantity of syringes supplied by the health authorities may not be sufficient and therefore must be reused if insulin has to be administered. Lack of trained health care providers in the field of diabetes leaves room for advice from non-qualified and untrained individuals. Such advice is likely not to be evidence based. Patients are frequently advised to slant the needle to almost being horizontal, leading to insulin being injected into the skin and causing scarring  or to transport insulin among ice cubes or in water. Most patients requiring insulin therapy have to pay for some of the medications out of pocket , and this is a barrier to receiving quality care, as most have poor incomes. In order to ensure that the guidelines are adopted and implemented, it is of critical relevance to establish continuous education programmes for health workers and diabetes care givers. When recommending the guidelines, superior outcomes in diabetes care must be a key decision-making criterion. Studies examining outcomes in patients with diabetes in which these guidelines have been implemented should be encouraged and supported. We wish to thank the patients who volunteered to have their photographs taken while giving an insulin injection. Springer Healthcare is not responsible for the validity of guidelines it publishes. The East Africa Diabetes Study Group (EADSG) received an unrestricted study grant from Novo Nordisk towards the hosting of a workshop on insulin injections in Kigali, 11 March 2018. Novo Nordisk had no role in the design of these guidelines or their publication. No article processing charges were received by the journal for the publication of this article. Editorial assistance in the preparation of this article was provided by Dr. Punit Srivastava and Ms. Divya Sadhna of Mediception Science Pvt Ltd. This was funded by the EADSG. Bahendeka Silver, Kaushik Ramaiya, Swai Babu Andrew, Otieno Fredrick, Sarita Bajaj, Sanjay Kalra, Bavuma Charlotte and Karigire Claudine have nothing to disclose. These guidelines are based on previously conducted studies and do not contain any studies with human participants or animals performed by any of the authors. Where photographs have been taken and used for demonstration, written consent was obtained and the photograph anonymised. In drawing up the East Africa Diabetes Study Group (EADSG) guidelines: insulin storage and optimisation of injection technique in diabetes management, the authors adhered to the international and ethical standards in compliance with the Uganda National Council of Science and Technology (UNCST) for developing clinical practice guidelines (CPG). Ministry of Health, Kenya. STEPwise survey for non-comminicable diseases risk factors 2015 Report. 2015. http://www.who.int/ncds/surveillance/steps/kenya/en/. Accessed 23 Dec 2017. Ministry of Health, Republic of Rwanda. Rwanda non-communicable diseases risk factors report. 2015. http://www.who.int/ncds/surveillance/steps/rwanda/en/. . Accessed 23 Dec 2017. Camberlin P: Climate of Eastern Africa. In: Oxford Research Encyclopedia, Climate SciencE (oxfordrecom/climatescience). edn. : Oxford University Press, USA; 2018: 1–52. http://oxfordre.com/climatescience/view/2010.1093/acrefore/9780190228620.9780190228001.9780190220001/acrefore-9780190228620-e-9780190228512?print=pdf. Accessed 02 Dec 2018. American Association of Diabetes Educators. Teaching injection technique to people with diabetes. American Association of Diabetes Educators 2017. https://www.diabeteseducator.org/docs/default-source/practice/practice-documents/practice-papers/teaching-injection-technique-to-people-with-diabetes.pdf?sfvrsn=0. Accessed 9 Jan 2018.
de Meijer PHEM, Lutterman JA, van Lier HJJ, van’t Laar A. The variability of the absorption of subcutaneously injected insulin: effect of injection technique and relation with brittleness. Diabet Med. 1990;7(6):499–505. http://doi.org/10.1111/j.1464-5491.1990.tb01431.x. Donner T. Insulin—pharmacology, therapeutic regimens and principles of intensive insulin therapy. [Updated 2015 Oct 12]. In: De Groot LJ, Chrousos G, Dungan K, et al., editors. Endotext [Internet]. South Dartmouth (MA): MDText.com, Inc.; 2000. Available from: https://www.ncbi.nlm.nih.gov/books/NBK278938/table/insulin-pharmacology.factorcomm/. Accessed 23 Jan 2018. Beckton Dickinson: Out Products -BD- Beckton Dickinson. https://www.bd.com/en-uk/products. Accessed 20 Jan 2018. Giving an insulin injection. Available at https://medlineplus.gov/ency/patientinstructions/000660.htm. Accessed 23 Jan 2018. How to inject insulin. Available at https://www.diabetes.co.uk/insulin/how-to-inject-insulin.html. Accessed 20 Jan 2018. Injecting insulin and children. Available at https://www.diabetes.org.uk/guide-to-diabetes/your-child-and-diabetes/insulin-and-your-child. Accessed 20 Jan 2018. Atun R, Davies JI, Gale EAM, Bärnighausen T, Beran D, Kengne AP, Levitt NS, Mangugu FW, Nyirenda MJ, Ogle GD et al: Diabetes in sub-Saharan Africa: from clinical care to health policy. Lancet Diabetes Endocrinol. 2017. http://doi.org/10.1016/S2213-8587(17)30181-X. Huffman MD, Rao KD, Pichon-Riviere A, Zhao D, Harikrishnan S, Ramaiya K, Ajay VS, Goenka S, Calcagno JI, Caporale JE et al. A cross-sectional study of the microeconomic impact of cardiovascular disease hospitalization in four low- and middle-income countries. PLoS One. 2011;6(6):e20821. http://doi.org/10.21371/journal.pone.0020821.